These pups seem less than scared. Getting a new puppy accustomed to his surroundings takes time and patience. Fear or insecurity can complicate the process. To help a puppy learn about the world around him, it is important to be able to tell when he is scared so you can address it appropriately. Posture is one of the easiest ways to spot a petrified puppy. A lowered head, tucked tail or both may tell you that a young dog is feeling fearful. The puppy's back may appear almost arched as he pulls his tail toward his abdomen. Some dogs will go into a crouched or lying position. The puppy's tail is an effective indicator of his emotions. A tucked tail is the most obvious sign that a dog sees, feels or hears something he does not like. A fast wagging, low tail may show he is nervous and might be ready to bolt. If a puppy has his tail held too high and stiff, he may be feeling guarded and not quite sure of what he is about to experience. A wide-eyed stare with no blinking could mean a puppy is apprehensive but afraid to look away. A puppy that will not make eye contact or keeps his gaze down could be feeling insecure. If your puppy is looking back and forth rapidly, he may be uncomfortable and looking for an escape. A scared puppy usually will have its ears pointed straight back. 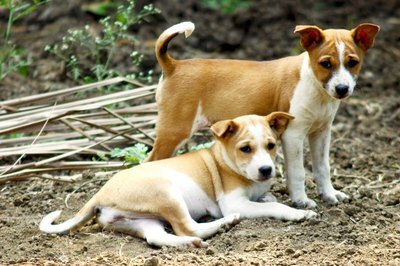 A scared puppy might combine a crouching posture and lowered head with a sideways trot. This will enable him to move away without taking his eyes off of whatever is causing his fear. A fearful puppy might move in an unnatural, stilted manner or sprint in the opposite direction of what is intimidating him. A scared puppy also is likely to get as small and concealed as possible, either behind a large object or his person's legs. Raised fur, whining, shaking or spontaneous urination are all common indicators of fear. Compulsive and sudden licking of paws or excessive yawning can show a puppy is uncomfortable in his environment. Any or all of these behaviors can show a puppy is scared. The most important step in alleviating your puppy's fearfulness is observation. A stranger might miss any of these signs. Only you will know how your puppy is feeling and when he needs some emotional support. If multiple signs arise suddenly, you might want to take a quick trip to the veterinarian to make sure there is nothing else underlying your puppy's insecurity. After getting to know these signs, the next step is figuring out what you can do to lessen the fear. Most young puppies can be calmed by a reassuring touch in the form of an ear rub or shoulder scratch. Other puppies respond best to a soothing voice or a familiar command, which physically redirects the puppy's energy and switches the mental focus away from the fear. Having some of his favorite treats on hand can help redirect the puppy's fear to one in which a reward is received. Each puppy's calming influence will be unique. It is important to find what works for your puppy. Is There Really a Difference in Puppy Foods?